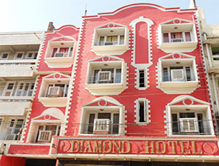 Counted among the best budget hotels in Jammu, Hotel Diamond is a leading budget hotel with cheap rates and therefore, it is simply reasonable for all the sections of tourists. The hotel is situated in the area of Below Gumat, Jammu. It is in a close proximity to the bus stand. It is also situated in an easy reach from the Jammu airport, railway station and all the significant tourist charms of the region. The Hotel Diamond is popular among the tourists for its accommodation options that are highly affordable options, warm hospitality, friendly assistance from the reservation counter staff, making the stay worthwhile. The hotel is perfect for all types of travelers, students, youth travelers, hostel travelers, foreigners and young professionals. Accommodation Hotel diamond comprises 13 well appointed rooms, that are divided into three categories- Three Bed AC, Normal AC room and Non AC. All the rooms have delightful and luxurious interiors. All rooms are designed in a way to provide the utter comfort to the guests. The guests get the various cozy room amenities such as air condition, intercom, cable TV, mineral water, shower area, sofa unit, all day round hot and cold water and a geyser in the bathroom. These amenities make the stay perfectly relaxing. Dining The hotel provides various lip smacking delicacies to the guests. The scrumptious dishes served to the guests stimulate their taste buds. The factor that adds the feather in the cap of the dining services in the Hotel Diamond is the room services that serve food to the guests in their room. There is no need of going anywhere to enjoy the palatable dishes. We, at the Tour My India, guarantee you a hassle free relaxing accommodation in Jammu. The attractive list of comfy hotels encompasses the Hotel Diamond as well. Avail the best deals offered on the accommodation in the Hotel Diamond and be assured of a trip experience to cherish for a lifetime!